Wayne E. Wright is the Associate Dean for Research, Graduate Programs, and Faculty Development and the Barbara I. Cook Chair of Literacy and Language in the Department of Curriculum & Instruction in the College of Education at Purdue University. He provides training for future and current educators in the areas of ESL teaching methods, literacy, assessment, technology and research. 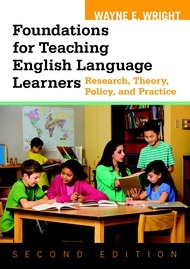 Wright has extensive experience as a researcher and practitioner in schools in the United States and internationally. Wright is the author of numerous research articles related to language minority education, and serves as the founding editor of the Journal of Southeast Asian American Education and Advancement. He has presented his research and provided training for language teachers throughout the world. In 2009 Wright was a Fulbright scholar and visiting lecturer at the Royal University of Phnom Penh, Cambodia, where he provided training and assistance to the university and students in the M.Ed. program. He and his wife Phal are the parents of three amazing children.